With international commerce forming a major part of business, and increasing all the time, many thousands of businessmen and women traverse the world on a regular basis. It is very helpful to have a watch that can give you the time in your destination, and many makers offer timepieces with world time functions. These superbly functional and very impressive watches are accurate and precise, and many can offer you superb interpretations of the time around the world in many countries and cities at the same time. 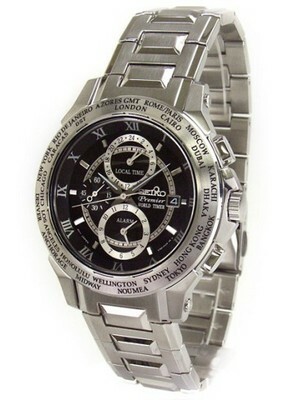 At Creation Watches we have some great models on offer, but be aware there is a great deal of choice! 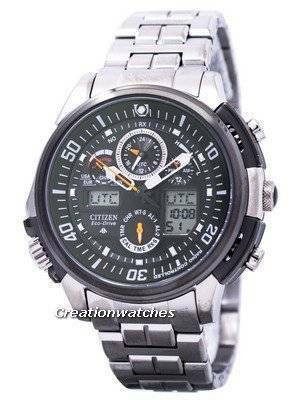 For instance, the Citizen Promaster Skyhawk EcoDrive Titanium JY8000-50E is a superbly designed men’s watch that offers some excellent features. This radio controlled watch is technologically advanced and uses the radio technology to adjust the time automatically and with the utmost accuracy. Being powered by Citizen’s excellent EcoDrive system, it offers accurate time all the time without the need for battery changes. This is, make no doubt about it, a top of the range watch with superb functions, and at less than $800 is something of a bargain when ranked against rivals. Another great radio controlled watch, and one that is unique in its style and design, is the Seiko Spirit Solar Radio Wave Control World Time SBFG003, a men’s watch with a difference. This digital display watch has a touch of the retro look about it with its square face, but make no mistake that this is a superbly crafted and very accurate watch that also comes with automatic time adjustment. The watch can display dual time zones at the same time, making it very useful for frequent travellers and holidaymakers alike. It’s not just men who have an excellent choice of watches with world time functions: there are many women’s watches that also include the feature. It’s no surprise to find that the excellent Casio G-shock range includes many such watches, and we have picked out the Casio Baby-G Chronograph Alarm World Time Watch as an example of a watch for ladies that is worth considering. Not only does it feature the modern and fun design typical of the Baby-G range, but its range of features is as impressive as any. Available in a variety of colours, this really is a bargain buy at less than $100! So, if you’re travelling a lot, invest in a world time watch for greater accuracy. Newsletter : Orient Bambino Watches On Sale – Coupon Code Inside! !